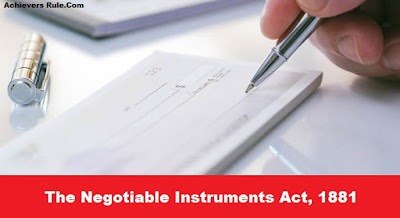 What is Negotiable Instrument Act ? A Negotiable Instrument Act can be a cheque, a bill of exchange or a promissory note that is payable to either a bearer or to order. So, a negotiable instrument is basically a written document which is created in favor of someone and can be easily transferrable. This Act came into force in the year 1881. The Negotiable Instrument Act is applicable to all parts of India except Jammu and Kashmir. Sections 31 and 32 of the RBI Act, 1934 helps to guide this Act. The instruments should follow the given conditions of negotiability. It should be possible to transfer the instrument easily by the custom of trade. The person who gets this instrument in his/her name should be able to withdraw it easily without any kinds of defects. A negotiable instrument provides right to property which can easily be transferred without any formality. Any defect on the title made by the transferor or by any other holder of the instrument shall not affect the bona fide transferee. A Negotiable Instrument can be transferred any number of times till its maturity. It is not mandatory for the holder of the instrument to inform the party who is supposed to pay for the instrument. Words such as ‘for value received’ may not be written because the payment of consideration is presumed. The words are usually added as an evidence. The holder is expected to pay properly because a dishonor would lead to a complete exploitation of all the persons who are party to the instrument. It can be presumed that the negotiable instrument has been made or drawn on a particular date. If the acceptance is not dated every accepted bill of exchange is presumed to have been accepted within a reasonable time after its issue and before its maturity. It shall be known that every transfer of a negotiable instrument was made before its maturity and in the particular order as it appears. It shall be presumed that a lost promissory note, bill of exchange or cheque was duly stamped. It shall be presumed that the holder of a negotiable instrument is the holder in due course and there is no fraudulence involved in it. A promissory note is not a currency note(which it is often mistaken to be) but is an instrument in writing that contains an unconditional undertaking to pay a certain sum of money to the order of a certain person or bearer of an instrument which is signed by the maker. A verbal promise cannot be considered a strong legal process. So, it should be in writing irrespective of whether being written in pen or pencil. It's just that it should not be easily possible to alter it. It must express a clear understanding to pay: Just an acknowledgement wouldn't be enough so there must be an clear understanding to pay. The maker must be certain of the identity of the person who is going to pay. If two or more persons promise to pay then that can be done jointly. The payee must be certain of the person to whom the promise has been made. If there is a mistake in the name of the payee or his designation it can be proved by evidence. The promise should be made to pay legal tender money and not old coins or any other stuffs. A promise to deliver anything else instead of money cannot be considered as a promissory note. The most important thing of promissory note is that the name of the payer, the payee and also the amount to be paid must be certain. A bill of exchange can be defined as an instrument in writing signed by the maker which contains an unconditional order that directs a certain person to pay a certain sum of money to the order of a certain person or to the bearer of the instrument. Thus, a bill of exchange, is a document of debt written by the creditor and accepted by the debtor. It should be in writing form. It must be signed by the drawer. The drawer, drawee, payee and the amount to be paid must be certain. The document should be properly stamped. In a promissory note there are only two parties that is the debtor and the creditor. But, in a bill of exchange, there are three parties- drawer, drawee and payee. In case of a promissory the debtor and the creditor are not the same person, while in a bill of exchange the drawer and payee or the drawee and payee may be the same person. A promissory note contains an unconditional promise to pay to the order of the payee, whereas in a bill of exchange the drawee should pay according to the direction of the drawer. In case of promissory note, it is presented for payment without any prior acceptance by the maker. A bill of exchange is payable after its acceptance by the drawee before it is presented for payment. The liability of a drawer in case of a bill of exchange is conditional but is considered to be absolute in case of promissory note. The maker of the promissory note has relation with the payee, while the maker or drawer of an accepted bill has relations with the acceptor and not the payee. Foreign bill of exchange can be protested for any kind of dishonour as and when required but no such protest is needed in the case of a promissory note. When a bill of exchange is dishonoured it is mandatory to give a due notice of dishonour by the holder to the drawer and the intermediate endorsers, but no such notice is required for promissory notes. it is drawn in India on a person residing outside India but payable in India. If a bill is drawn by a merchant in kolkata on a merchant in chennai. It is payable in Bombay. The bill is an inland bill. A bill is drawn by a chennai merchant on a person in London, but is made payable in India. This is an inland bill. A bill is drawn by a merchant in kolkata on a merchant in Delhi. It is accepted for payment in Japan. The bill is an inland bill. A bill which is not an inland bill is a foreign bill. 1. A bill drawn outside India and made payable in India. 2. A bill drawn outside India on any person residing outside India. 3. A bill drawn in India on a person residing outside India and made payable outside India. 4. A bill drawn outside India on a person residing in India. 5. A bill drawn outside India and made payable outside India. A bill which is payable after a fixed time is known as a time bill. A bill payable at sight or on demand is a demand bill. A bill drawn and accepted for any trade related transaction can be termed as a “trade bill”. A bill drawn and accepted only to provide financial help to some party is known as an “accommodation bill”. A cheque must satisfy all the requirements as required for a bill of exchange. Drawer: The maker of a bill of exchange is called the ‘drawer’. Acceptor: If someone else accepts the money in place of the drawee then he is called the ‘ acceptor’. Payee: Payee is the person to whom the money is to be paid as directed by the instrument. He is considered to be the actual beneficiary. Where he signs his name and makes the instrument payable to some other person, that other person does not become the payee. Indorser: When the holder transfers the instrument to someone else, the holder becomes the ‘indorser’. Indorsee: The person to whom the bill is indorsed is called an ‘indorsee’. Holder: A person who is legally entitled to the possession of the negotiable instrument in his own name and to receive the amount thereof, is called a ‘holder’. Maker. He is the person who promises to pay the amount stated in the note. He is the debtor. Payee. He is the person to whom the amount is payable that is the creditor. Holder. He is the payee or the person to whom the note might have been endorsed. Drawer. He is the person who draws the cheque, i.e., the depositor of money in the bank. Drawee. It is the drawer’s banker on whom the cheque has been drawn. Payee. He is the person who is entitled to receive the payment of the cheque.